Peel and finely dice onion and garlic. Peel and dice carrot. Wash tomato and bell pepper, then cut into chunks. Peel and dice potatoes. Cut chicken thighs meat into large chunks and season with salt & pepper. In a pot, heat 1 tbs olive oil, then add chicken and gently fry until golden brown, stirring regularly to prevent sticking to the pan. When the meat is done, remove from pot. Add some more olive oil, if needed, then add diced onions and lightly fry until translucent. Add garlic, carrots, tomato, bell pepper and potatoes, and bay leaves. Cook for a couple of minutes, until the carrots begin to soften a bit, then return the chicken to the pot and add stock. Season with salt & pepper, add chopped parsley and bring to a boil, then reduce heat and let it simmer for about 20 minutes, until the vegetables are almost cooked through. Meanwhile, preheat oven to 190°C / 375°F and start the dumplings. Place flour in a bowl, add a pinch of salt and baking powder. Grate in butter and mix together until the dough looks like breadcrumbs. Add 50 ml of cold water and knead together into a ball of dough. Divide the dough into smaller pieces and shape into balls (about 6-8). 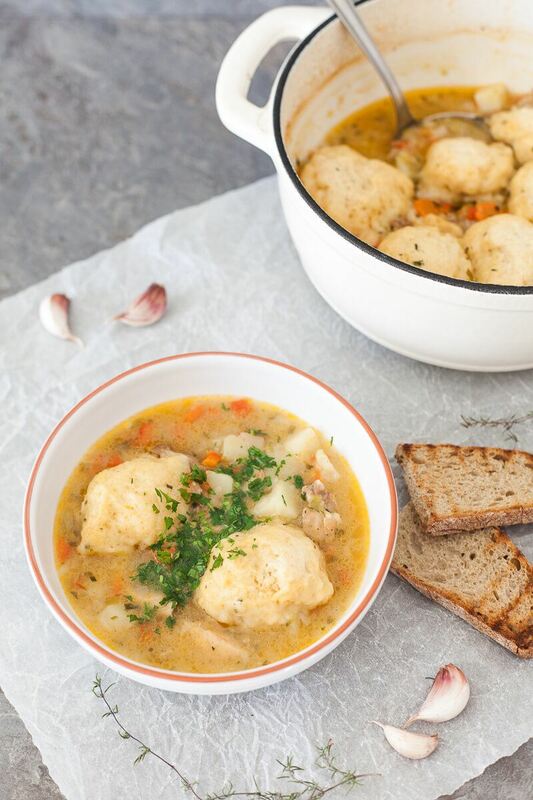 Place dough balls into the chicken stew, cover with the lid and transfer to the oven. Bake for 30 minutes. When the time's up, remove from oven carefully and uncover the pot. The dumplings should be well risen and fluffy. Serve hot and top with some fresh chopped parsley.